July 2, 1916: 68 men report for roll call. On July 1, 1916 soldiers of the Newfoundland Regiment were ordered to attack the German lines at the village of Beaumont-Hamel near the Somme River. Of the regiment’s 798 soldiers, 310 were killed and 374 wounded. The grassy terrain around the Newfoundland War Memorial in northwestern France is still scarred by shell craters and the trenches from which the Newfoundland Regiment clambered into No Man's Land on this day 100 years ago. The effects of that lethal engagement at Beaumont-Hamel, in the first hours of the Battle of the Somme, are still deeply felt in Newfoundland and Labrador. July 1 is Canada Day throughout the country, but in Newfoundland it is also Memorial Day, and serves the same solemn function as Remembrance Day does in the rest of Canada. Memorial Day, however, does not align with a day of victory and of peace regained. It marks one of the bleakest disasters in the island's history. Nearly the whole of the Newfoundland Regiment, mustered especially to fight for the Empire, was killed or wounded within 30 minutes of going over the top. Their sacrifice was quick and extreme, and failed to gain a single metre of ground. The regiment was rebuilt, and fought on until Armistice Day, but Newfoundland never fully recovered from its war effort. The far-reaching consequences for the province's social, economic and political life continue to this day. The battle at Beaumont-Hamel has been minutely studied, but one mystery remains, for outsiders and some Newfoundlanders alike. Why is this pointless slaughter the focus of the island's war memory, and not some other, more successful engagement by the regiment from later in the war? 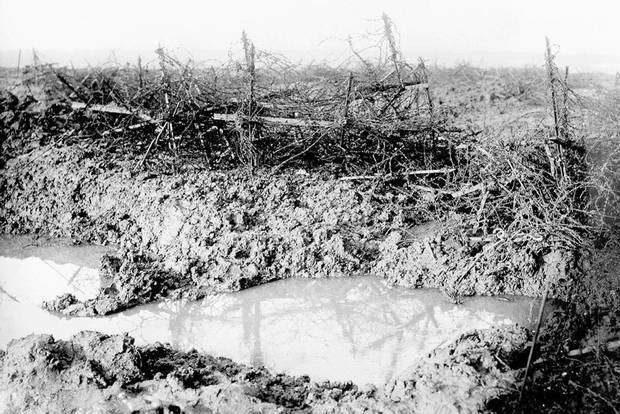 The battlefield at Beaumont-Hamel on the first day of the Somme offensive was a quagmire of mud, water and barbed wire. 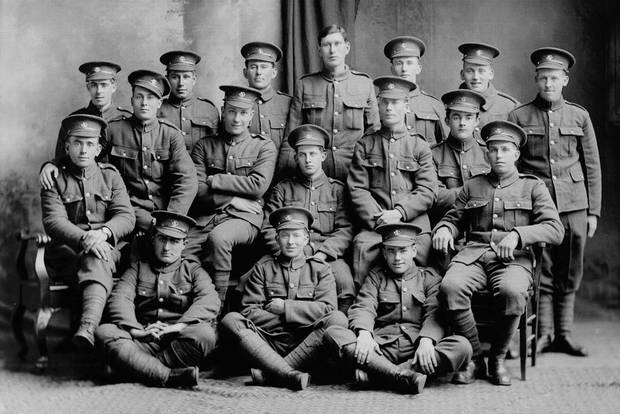 The approximately 800 officers and soldiers of the 1st Newfoundland Regiment were nearly wiped out in the battle. To raise a fighting force in an independent colony of fewer than 240,000 people is no small thing, but Newfoundland's governor and prime minister committed to it without consulting the legislature. Volunteer recruitment was swift, and the first 537 troops shipped out of St. John's to much rejoicing in October, 1914. Each man wore his own hat because there had been no time to produce uniform headgear. They trained in Scotland and England, then fought at Gallipoli and in Egypt under British command before being posted to France. On the night of June 30, 1916, the men marched to their positions at Beaumont-Hamel, singing Keep the Home Fires Burning. Their orders were to join in the third wave of attack and seize the third line of German trenches, which were wrongly presumed to have been pulverized by heavy advance bombardment. But the Welsh regiments that launched the attack early the next morning were mauled by German machine-gun fire. The forward British trenches were quickly clogged with dead and wounded. After some confusion, the Newfoundlanders were ordered to attack from their rear position. Many were shot before they reached their own front line. "The heaviest casualties occurred on passing through the gaps in our wire, where the men were mown down in heaps," the regiment commander wrote in his battle record. An officer who saw the men advance wrote: "Instinctively they tucked their chins into an advancing shoulder, as they had so often done when fighting their way home against a blizzard in some little outport in far-off Newfoundland." Of the 758 soldiers and officers who made the attack, only 68 were fit to answer roll call the next day. Some of the dead, such as Private William Morgan of St. John's, were as young as 16. A British superior officer, in a masterpiece of English understatement, commended the regiment "on their extreme steadiness under trying circumstances." 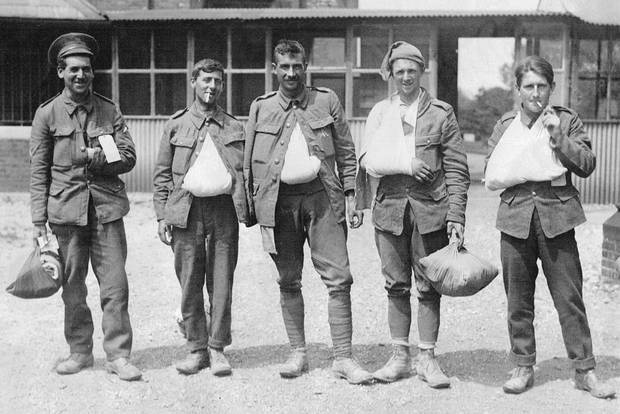 Lance Corporal Ernest Kelly (second from the right) was one of the Newfoundlanders and Labradorians wounded at Beaumont-Hamel. In this photo, taken four days after the battle, he poses with fellow survivors at Wandsworth Hospital, London. The early response in Newfoundland to the disaster included a surprising eagerness to send more troops. "The losses in the field have stimulated recruiting," the governor reported. It helped that propaganda from the British War Office made the Somme push sound like an overall success. Under the banner headline "British and French Smash Foe," The Globe's first edition after the campaign began quoted official sources as saying German losses were heavy, Allied losses light. "After the first day of battle, we may say with thankfulness that all goes well," The Globe concluded. In fact, more than 19,000 British soldiers died that day, and nearly 40,000 were wounded. More recruits meant fewer men for the fisheries, more hardship for families and continuing expenses for supplying the troops. Islanders sewed clothes for the troops and raised $1-million among themselves, and the government borrowed millions more. The regiment's later exploits during the war included a bloody but successful action at Gueudecourt in October, 1916, and a crucial, heroic stand during the Battle of Arras in April, 1917, where 10 men held off a German attacking force for four hours. In all, nearly 6,000 men served in the Newfoundland Regiment, two-thirds of whom were killed or wounded – "the largest proportion of casualties suffered by an overseas contingent of the imperial forces," David Macfarlane wrote in his 1991 history-memoir The Danger Tree, sections of which have been dramatized in a touring show called The Door You Came In. In early 1918, King George V directed that the fighting Newfoundlanders be renamed the Royal Newfoundland Regiment – the only time such an honour was bestowed during the war. 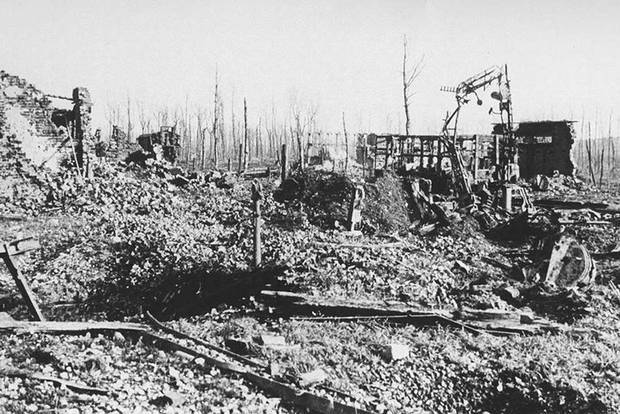 Railway station ruins at Beaumont Hamel in 1917. By Armistice Day, Newfoundland's war obligations had added $15-million to its public debt, which ate up one-quarter of revenues in annual debt service. Pensions had to be paid, and shattered families to be taken care of, all without the social welfare system we know today. Public works projects, falling commodities prices and the start of the Great Depression drove the island's debt to $100-million by 1932. An attempt to reduce veterans' pensions led to a riot in St. John's, where the Colonial Building was ransacked and the prime minister forced to flee to safety. The government declared bankruptcy and appealed to Britain to help sort out its affairs. In 1934, Newfoundland became the first colony in the history of the British Empire to give up elected government and return to stewardship from London, through an appointed Commission of Government. That lasted until a bitterly divided population voted by a narrow majority in 1948 to enter Canadian Confederation, ending all hope of a return to independence. By the time Dominion Day was overlaid on Memorial Day on July 1, 1949, many were asking: by going so ambitiously to war, had Newfoundland traded away its freedom? The King of Belgium leaving Beaumont-Hamel in 1917. Beaumont-Hamel and its ghosts have shown up in the works of many a Newfoundland artist, novelist and musician. Memorial University was named to honour the war dead. Commemorations of Beaumont-Hamel in this centenary year include formal ceremonies in France, where the Prince of Wales and 3,000 others will stand before the imposing bronze caribou that has guarded the Beaumont-Hamel Newfoundland Memorial since it opened in 1925. Elsewhere, the focus of memorialization has become more social and personal. Ours, a new opera by John Estacio produced by St. John's Opera on the Avalon, tells the story of Thomas Nangle, the priest who was chaplain to the Newfoundland Regiment, identified many of the bodies during and after the war, and led the effort to buy the Beaumont-Hamel site as a permanent memorial. "The opera is totally about remembrance and trauma," said librettist and playwright Robert Chafe, who, in one chorus uses epitaphs contributed by the families of men buried in France. Nangle, who was wracked by PTSD and eventually left the priesthood, also figures in a new touring display at the Canadian War Museum, along with Armine Gosling, a suffragette and Women's Patriotic Association leader who led a push for better health care on the battlefield and at home. The Rooms, the provincial museum and archive in St. John's, on Friday opens a 6,000-square-foot permanent exhibition about the Royal Newfoundland Regiment that is "more social than military history," said CEO Dean Brinton. The show features many personal stories, some brought to life by actors relating tales told in war letters. "The war affected just about every family," said Mr. Brinton, whose grandmother was traumatized when her older brother and only provider was killed at the front. The exhibit also has the ship's bell from the vessel that carried the first soldiers to war, the large "death pennies" sent to families of the fallen, and an old guest-book from the Beaumont-Hamel memorial opened to pages from 1940. Northern France was under German occupation at the time, and the pages are filled with German names, with "Heil Hitler!" written in the comments section. "The German army went back to Beaumont-Hamel, and signed the guest book," Mr. Brinton said. 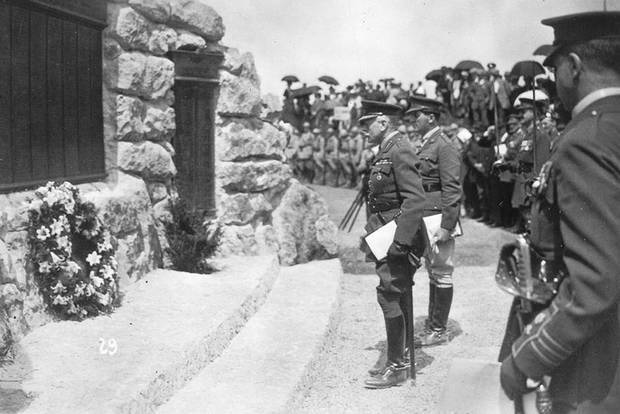 Field Marshal Earl Haig and Lt. Col. Thomas Nangle at War Memorial, Beaumont Hamel Park, France, June 7, 1925. "What is it about this event, this scar, that we cling to so tightly?" said Mr. Chafe, referring to the battle at the dark centre of his opera. Like many Newfoundlanders, he sees a direct causal link between the doomed attack at Beaumont-Hamel and the seismic social and political upheavals that followed. "It's often seen as the first domino to fall in the loss of our nationhood and sovereignty," he said. In that sense, Beaumont-Hamel is the polar opposite of Vimy Ridge, which for many Canadians represents a sacrifice that strengthened nationhood. It may also be that Beaumont-Hamel, as a small episode in the four-month calamity of the Somme, carries its share of the larger battle's status as the war's premier symbol of senseless carnage. To this day, we cannot turn away from the horror of it. 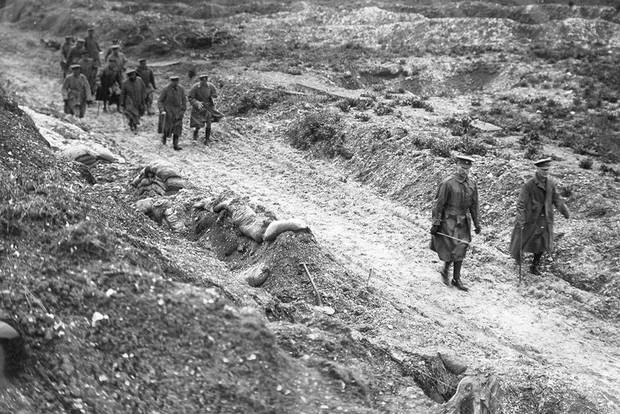 The magnitude and suddenness of the losses at Beaumont-Hamel, and the fact that it was the first huge setback for the regiment, may also have helped keep it central to Newfoundland's war memory. "This was our Gallipoli," said Newfoundlander Dean Oliver, director of research at the Canadian War Museum, referring to the battle that defines the tragedy of war for Anzac troops. "Beaumont-Hamel is the great slaughter to be remembered forever more as the embodiment of the Great War for us. It's both a subject of enormous and undying pride, and the exemplar of the utter horrors of war."